We’d love your help. Let us know what’s wrong with this preview of Choice by Jennifer Snyder. People often say everything happens for a reason. Seventeen-year-old Jet Donavan Mathews is about to find out that statement is not always true. Jet will learn that sometimes there are moments which were never meant to occur, moments where you are left with a choice. 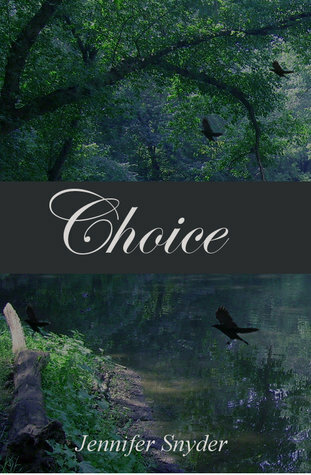 Choice is a Hereafter short story of approx. 2,500 words. To ask other readers questions about Choice, please sign up. I read this at the end of Touch. I liked getting Jet's back story. There were only two things I didn't like. Just like Touch, I wish it'd been a bit longer, or maybe incorporated with Touch. The other thing was I was looking for where he was hit in the head with the log. Somewhere in Touch it was mentioned, but I didn't see it in Choice. Other than that, I enjoyed his point of view and hope another book comes after to tell us what happens next. Make sure to read this one after . Knowing the events from Touch makes Choice more bittersweet/heartbreaking. I just wish the story had been a little longer, but that's what I always want from short stories. I'm hoping the story will continue... 3.5 stars. Reading Jet's Past gave us an view of his life..but i sure felt it was a bit rushed and abrupt..i mean how was he killed...something with log right?where was it? Choice shows us how he becomes a reaper and how jet makes the most difficult choice. This was an interesting short story which shone a bit of light on how Jet became a reaper! See my review of Touch and Choice together as they are now being presented on the Touch page. We learn more about Jet in Choice. In Touch he was more of a background character, he would just show up, smirk and disappear so I liked that we got to see what happened to him. It was sad, I wouldn't have taught that a seventeen yr old Jet would've been in that situation. And what happened to him was horrible, he was just trying to forget and have fun and here comes some @$$wholes, they just beat people up just because they can, poor Jet. Looks like he died alone. But w There might be spoilers. It was sad, I wouldn't have taught that a seventeen yr old Jet would've been in that situation. And what happened to him was horrible, he was just trying to forget and have fun and here comes some @$$wholes, they just beat people up just because they can, poor Jet. Looks like he died alone. But we do know why he chooses to be a Reaper, made sense that he didn't understand and know what would happen if he crosses over. This is a very short read, a bit of back story on Jet, who we met in the first novella of the series, Touch. I am glad this short was included because it really helped us get to know Jet. It explained how he came to be what he is and what had happened in his life to make him who he is as we know him now. It was tragic and sad and it made my feelings for Jet grow by leaps and bounds! This book gave us some answers to the questions raised in Touch. My recommendation: A must read for the series, an This is a very short read, a bit of back story on Jet, who we met in the first novella of the series, Touch. I am glad this short was included because it really helped us get to know Jet. It explained how he came to be what he is and what had happened in his life to make him who he is as we know him now. It was tragic and sad and it made my feelings for Jet grow by leaps and bounds! This book gave us some answers to the questions raised in Touch. I loved getting to know Jet better in this short story. It was interesting to see how he was given a choice to determine his fate. Choice helped to answer some questions for me after reading Touch. I look forward to seeing where his story goes in the series. This short story goes along with Touch, that is also part of the Hereafter series which will be released late 2012. What a tragic glimpse into the events that led up to Jet becoming a Reaper. Although you know a little bit about what happened to him in Touch, he's still a mysterious character. It makes me want to learn more about him! VERY short but it was great to get Jet's perspective of his life and what happened. Jet's point of view in this short story in the back of the book Touch sheds a lot of light on a few things going on with him.